Can this be for real? Are the Kings really on the verge of sweeping? Tonight is Game 4 of the first round of the Stanley Cup Playoff series between the LA Kings and the Vancouver Canucks. The Kings have shocked the hockey world as they have beaten up and pummeled the reigning President's Cup (having the best record in the NHL) champions. Will that continue tonight? All I know is that I'll be sitting in my normal seats in the "Die-Hard" section, up in the rafters of Section 315, with my voice ready to scream and cheer. 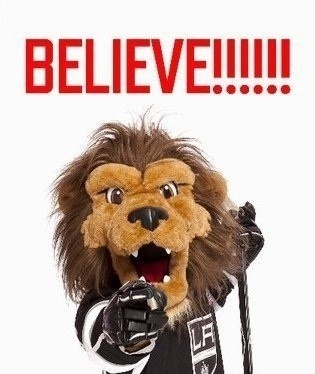 I won't make any predictions about tonights game, but I will say that there is no way our goalie losses 4 in a row. NO WAY! This series is over, it's just a matter of when. Hopefully, tonight is the night. To get you in the mod for some Kings hockey check out the below videos. Below is the LA Kings Playoff Intro. Here, Dan Patrick dons his Kings jersey as he talks about the team with the worst player to ever put on a Kings uniform, Jeremy Roenick. Weekend Autograph Opportunities: So Busy, You Can't Go To Them All! 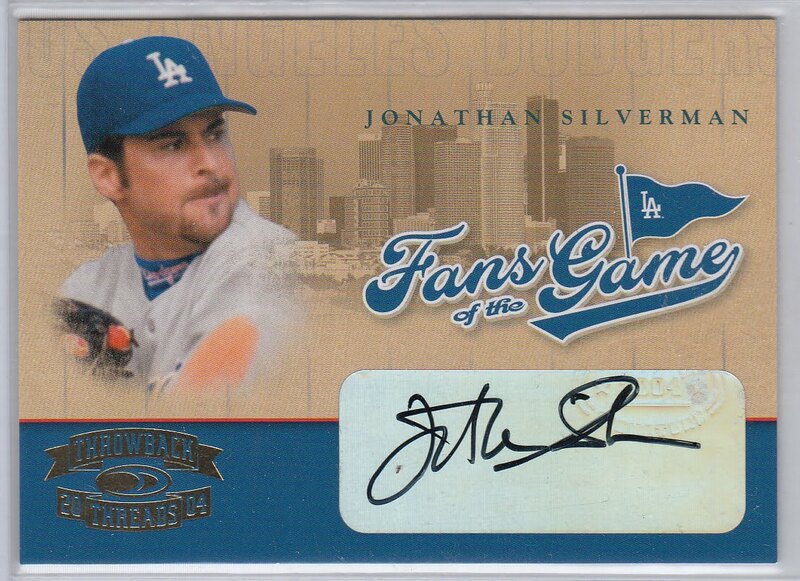 There are a ton of autograph signings all over the Southland this weekend. Below are just a handful that I am pointing out. 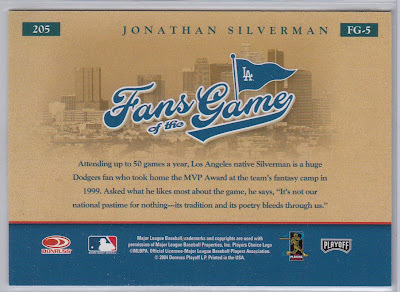 There's a card show, a Hollywood actors autograph show, Frank & Sons, the LA Times Festival of Books and a bunch of individual signings at cards shops and retail establishments all over the place. Heck, there's way to much to list here. Just check out my event calendar for a complete listing. 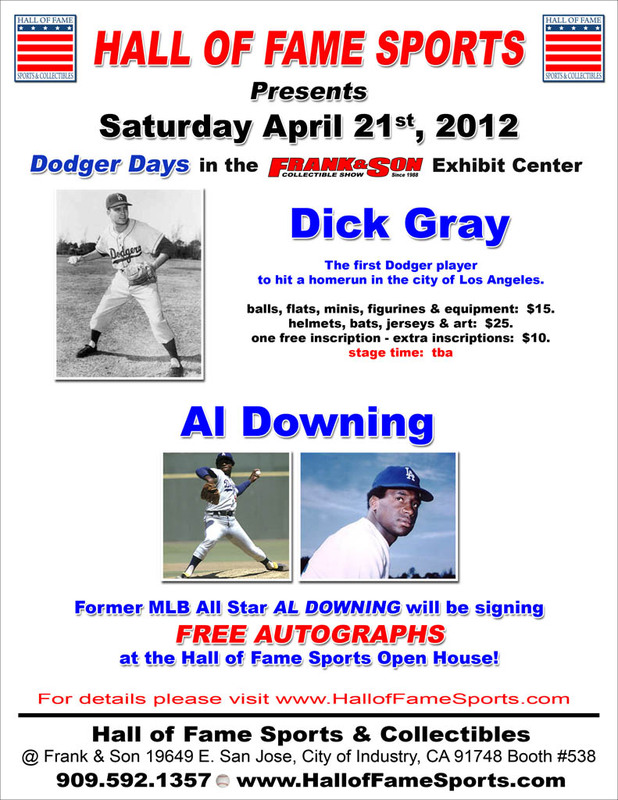 This weekend is the 2012 Los Angeles Sports Cards & Memorabilia Show at the Glendale Civic Auditorium. It will run from Friday the 20th to Sunday the 22nd. Go to this link for details. 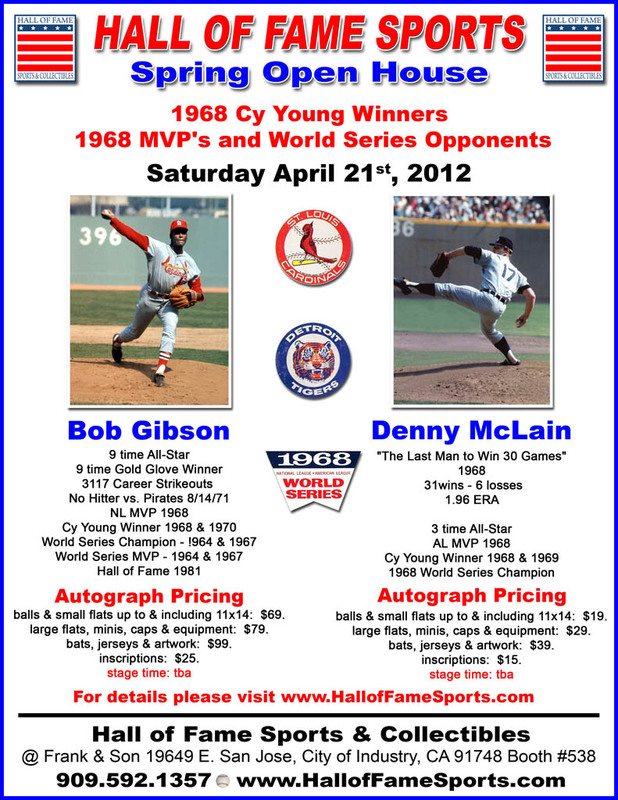 From my understanding, Memory Lane Auctions will be on-hand and will have for display a real T206 Honus Wagner card. Admission is also FREE!!! 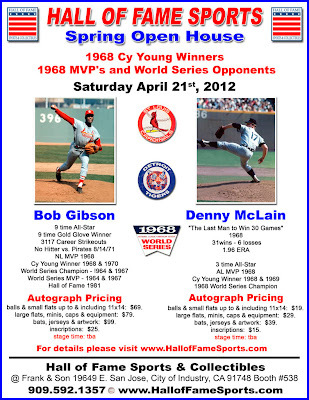 Also, there will be 2 autograph guest on both Saturday and Sunday. A weekend wouldn't be complete without a bunch of autograph opportunities at the Frank & Sons Collectors show in the City of Industry on Saturday, April 21st. 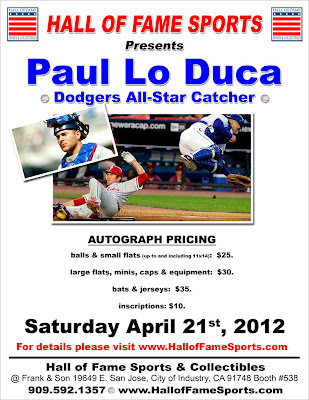 Check out the fliers below for details. Their website can be found here. 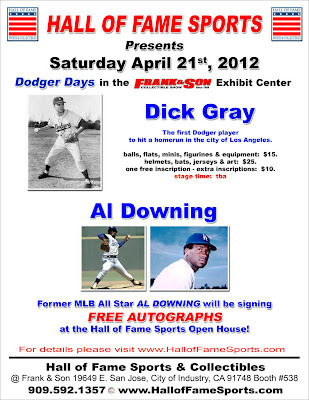 As just a friendly note, former Dodger Al Downing will be signing for FREE! Admission is also FREE! I know you love books. We all love books. Well, this weekend is the LA Times Festival of Books on the USC campus, and there will probably be more book related events there than any one person can stand. Heck, Kareem Abdul Jabbar will be there on Sunday at the Target Children's Stage. 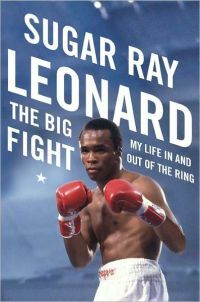 On top of that, one of my all-time favorite boxers will be there on Saturday at 4:30 PM at the LA Times Stage, Sugar Ray Leonard. Go here for a complete listing of events. All events scheduled are free, but USC parking is $10.00. Kareem Abdul Jabbar- "What Color Is My World?" 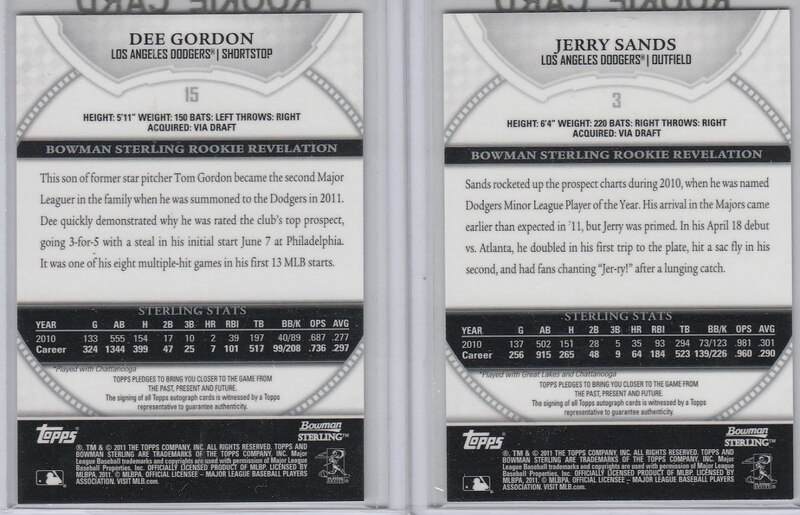 With Jackie Robinson day now past, I wondered what MLB has on auction from every team for fans to bid on. So I searched, and below is what I found. 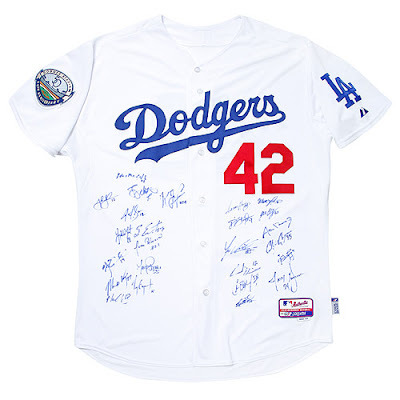 So far, MLB has team autographed #42 jerseys from every team in the league up for sale. I do not know if other items will pop up, so if you are interested, it makes sense to check back often. Above is a Dodgers jersey signed by the team. As of this posting it is at $775.00, so it ain't a steal. 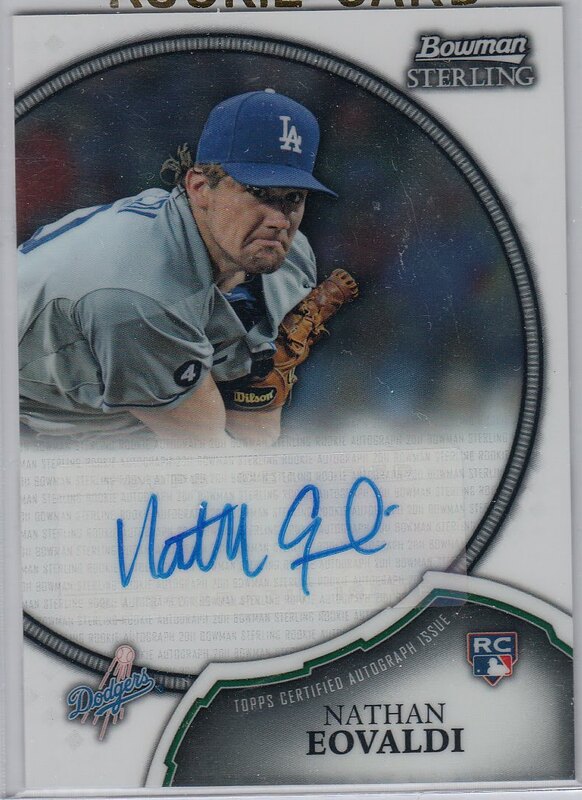 Of note, I do not think I see Clayton Kershaw's autograph there. He was the starting pitcher on Sunday, so it makes sense that he may have been overlooked when this jersey got passed around the clubhouse. If you haven't noticed, I've been a little slow with posting lately. I think it has a bit to do with the NHL playoffs starting and the Kings taking a commanding lead in their own series against the Canucks. On the other hand, as any blogger knows, sometimes the desire to post something up is outweighed by a need to take a little break from sitting in front of a computer all day. Anyway, that little funk is near its end and I am starting to feel revitalized. I guess I needed just a little blogging vacation. 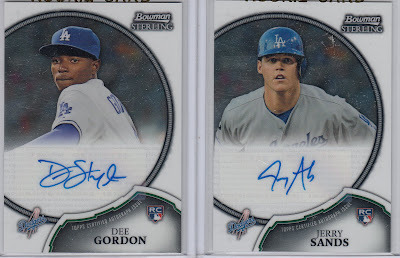 Below are a handful of recent eBay wins I had accumulated over the past several weeks. Check them out below. 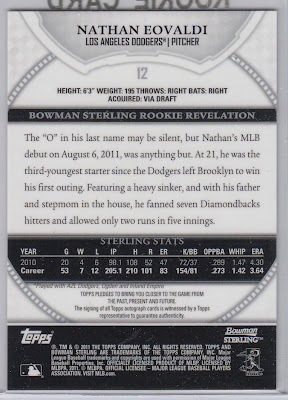 I really wanted this card. I had searched high and low for an affordable copy and finally found one through eBay's "Buy It Now" service. It is a 2008 Bowman Scouts autographed subset card of the legendary Ralph Avila. 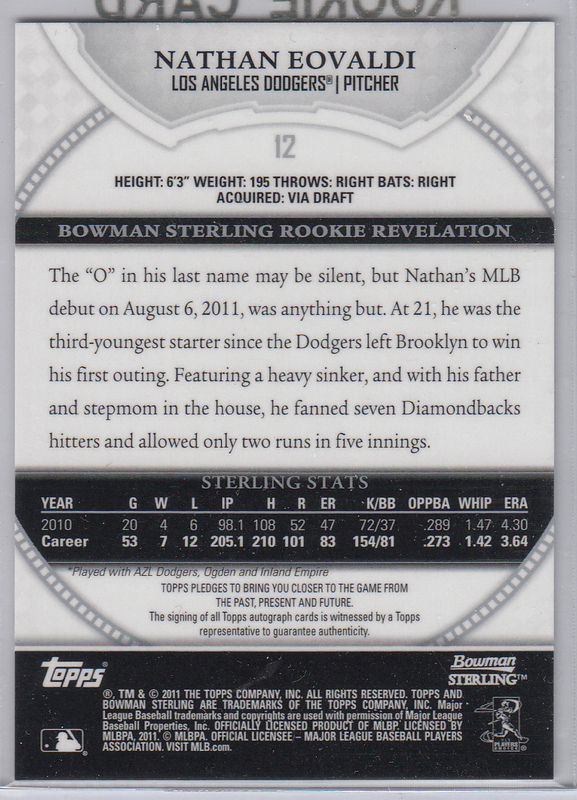 Up until a year or so ago, I didn't even know this card existed, but since finding out it has been on the top of my wish list. 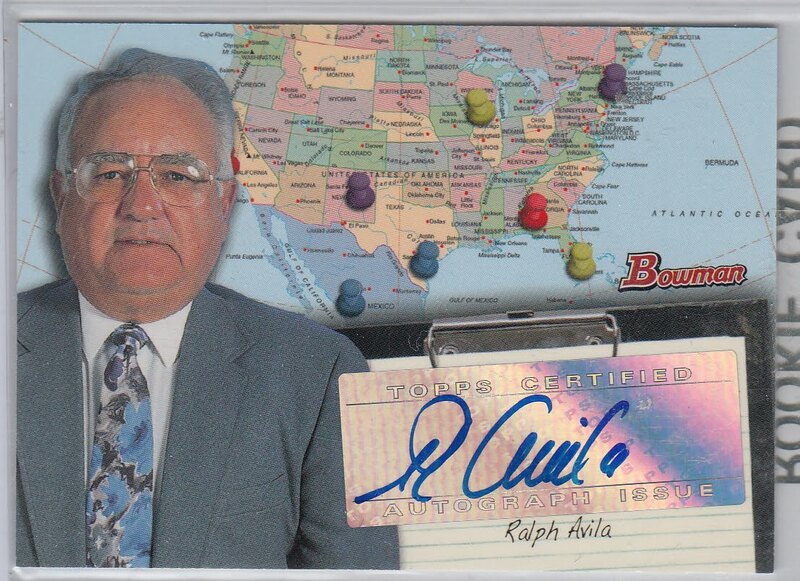 Ralph Avila is one of the Dodgers greatest scouts and a trailblazer in his profession. He started out as a Cuban revolutionary who quickly soured on Castro. Soon, Avila headed to Florida where he started a Baseball clinic for Cuban refugee kids to keep them out of trouble. Then, Al Campanis, the Dodgers personnel chief at the time, hired him as a "bird-dog" scout. Soon, he became Campanis' right hand man when it came to Baseball in Latin America. With some prodding from Campanis, he headed up the Dodgers search for talent in the Dominican Republic- before any other team went there. As the reverse of the card shown below indicates, Avila was responsible for the Dodgers originally signing Pedro Martinez. 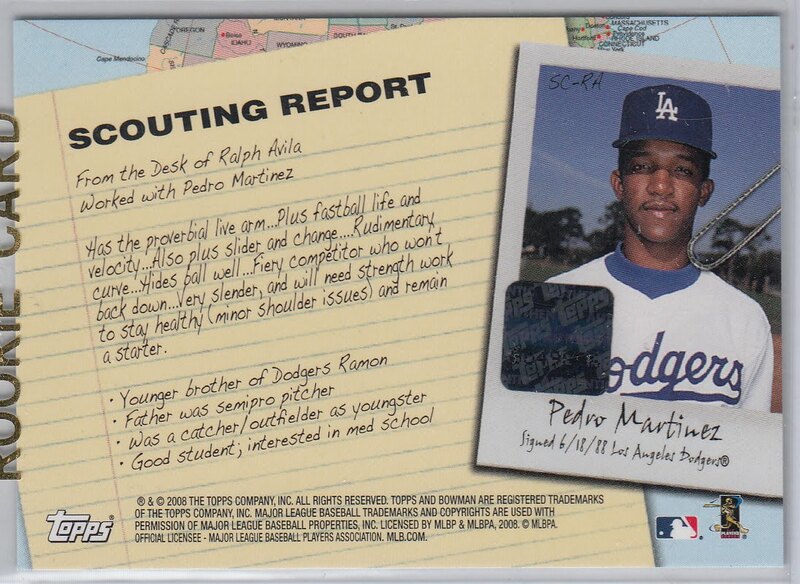 For more background on Ralph Avila go ahead and check these great articles about him: ESPN, MLB. Here is another eBay win. This is a Donruss "Fans of the Game" autographed card. 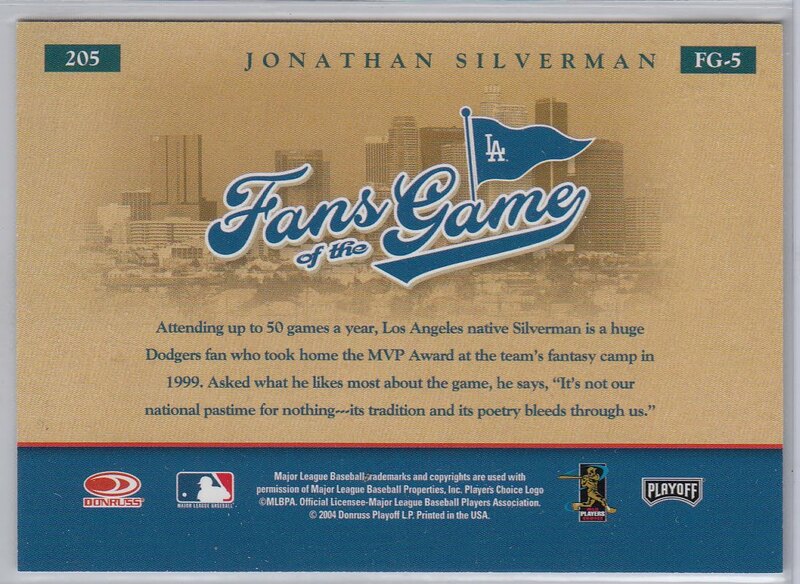 It is from 2004 and features actor Jonathan Silverman. I can't think of a show he's done in the past decade that I've seen, but I will say that his role in "Weekend at Bernie's" was awesome. It still ranks as one of my favorite comedies. 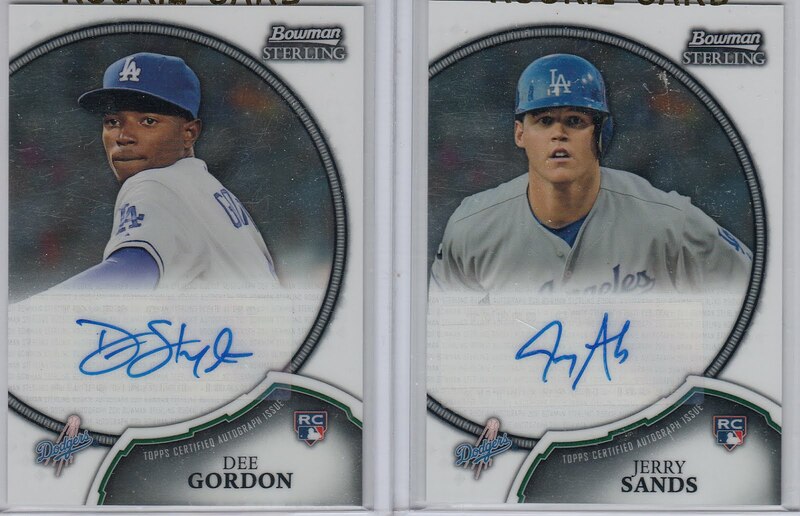 Here are a group of 3 2011 Bowman Sterling autographed cards of some Dodgers rookies. I had bought them as a lot at what I though was an affordable $12 bucks. Check out Nathan Eovaldi, Dee Gordon and Jerry Sands.